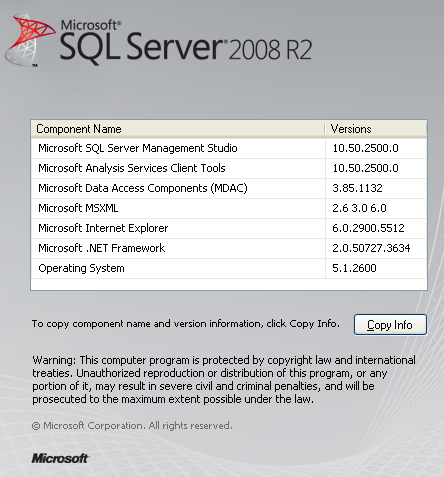 SQL Server 2008 R2 – Upgrading to Service Pack 1 Silently – IT & Digital. KB2528583 represents SQL Server 2008 R2 Service Pack 1 which went live early November 2011. It consolidates Cumulative Update 1 to 6 and fixes circa 100 issues in total. Today the first post SP1 is CU7. There actually is a possibility to slipstream SP1 into the original setup, as described here, but in my personal experience, the process results in versioning woes after deployment. In other words, I would not recommend it; instead I would take the classic road and simply apply SP1 immediately afterwards. Note that before applying SP1, SQL Server Management Studio’s Help > About information reveals version 10.50.1600.1. We’ll check if the version reflects SP1 properly in the end (which should be 10.50.2500.0 according to the KB article). Setup.exe is what we need. Now, what setup /? does not reveal, is a hidden switch to bypass the otherwise manual action of accepting the license agreement. What we need is the IAcceptSQLServerLicenseTerms parameter.